It’s Georgia week. Our third installment of Foy Your Information is presented in full compliance with the decisions of the 1959 Better Relations Committee. It was one of those double-take, slow-grin, moments that makes all the boxes of “Thank You” notes and budget approvals and form letters worth it. In November 1959, David Cleghorn, editor of the University of Georgia’s student newspaper, wrote a column bemoaning (and challenging) the loose ban on calling Auburn students “turkey buzzards” (apparently a horrible insult people once hurled our way) at football games. 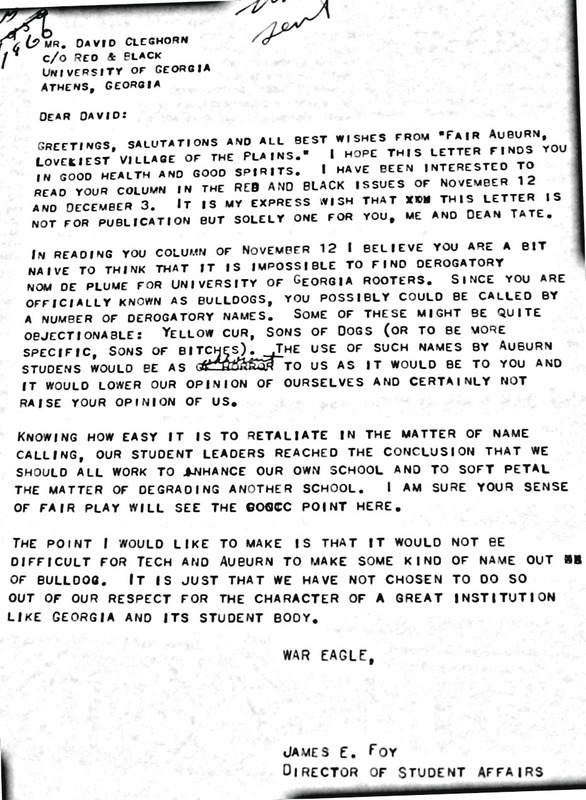 That year, a “Better Relations” committee comprised of students from Auburn, Georgia, and Georgia Tech determined that referring to Auburn as turkey buzzards, and to “the clean-cut young men of Bobby Dodd,” as Cleghorn called Georgia Tech players, as “Dirt Daubers” was in poor taste and should be avoided. But ol’ Dean Foy, in letter he sadly never sent to ol’ Cleggy, had a suggestion. Check out the previous two installments of Foy Your Information: The Case of the Pea Green Tigers and The Case of the Seminole Raid. And of course that other Foy thing. Related: Pat Dye responds to ‘loudmouth’ allegations. Wow….Dean Foy was the man. 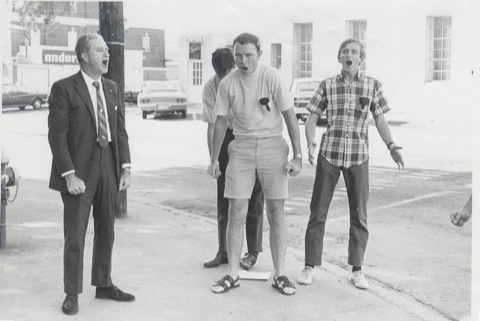 Ah 1959…the good old days when Auburn students going to the Ga Tech game were told that if trouble broke out between the student bodies and order could not be maintained, the band would play ” Dixie ” which was sure to cause all loyal sons and daughters of the south to quit beating on each other and come to respectful attention. Those were the days when we always played Ga Tech in Atlanta and most freshmen marched in the pajama parade a few days before the big game. Auburn students were also cautioned not to wear their rat caps on the Tech campus to avoid having to defend them from Tech students. Dean Foy would have made a great blogger. And AU64 – what the hell is a rat cap and why would anyone want to steal it? A rat cap was a glorious institution worn by all first quarter freshmen. At AU, it was orange with a blue bill, and looked sort of like the caps three year old male children might wear. Most wearers festooned there cap with slogans. Tech students also wore rat caps, and to steal one from a wearer attending another institution was indeed wonderful. Thanks Tom…was beginning to think I was the only one old enough to remember those great old days. As a dog myself, puppydog that is, I totally condone Dean Foy’s choice of words. I hate Georgia.